Publishing | The Junior League of Houston, Inc.
Do you know a library impacted by Hurricane Harvey? Are you looking for a creative way to give back to your hometown? Give the gift of cooking by donating a copy of Peace Meals to your favorite library. For only $20, the Publishing Committee will send a new Peace Meals to the library of your choice anywhere in the continental United States. At checkout, please note which library you are supporting. If your selected library has already been adopted, or if you do not designate a specific library, a copy of Peace Meals will be sent to an alternate library. Click here to adopt a library. 2018 marks the 10th anniversary of Peace Meals and the 50th anniversary of The Houston Junior League Cookbook! To celebrate these milestones, the Publishing Committee is offering an anniversary bundle. 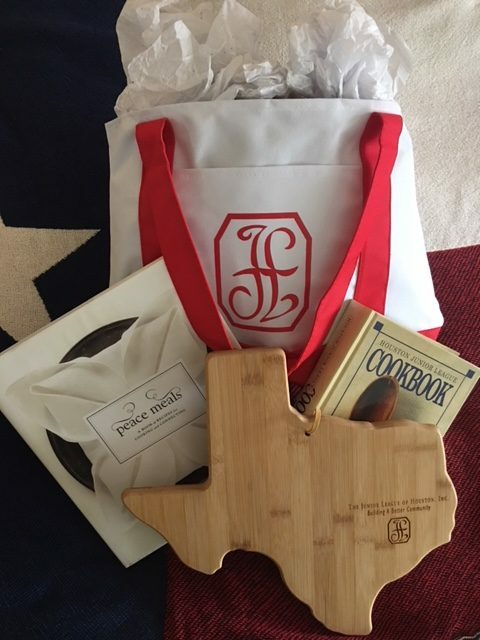 Now you can get both cookbooks, a special JLH tote and a one-of-a-kind Texas-shaped bamboo cutting board for just $50. Supplies are limited and this anniversary bundle won’t last long. Anniversary bundles will be available for purchase at the The Pantry between 10 a.m. and 2 p.m., Tuesday through Saturday, beginning Thursday, November 1, 2018. Contact the Publishing Chairman at publishing@jlh.org with any questions. The Junior League of Houston has two award-winning cookbooks available for purchase as well as an in-depth, historic look into Houston’s early beginnings. Your purchase of these publications supports the Junior League’s 36 community projects and its mission to promote voluntarism, develop the potential of women and improve the community through the effective action and leadership of trained volunteers. Call 713-871-6629 to complete your purchase. To purchase a book, click the appropriate link above or contact the League’s Publishing Committee at 713.871.6608 or 1.800.432.2665. All orders placed via the Junior League website will be shipped to the purchaser and will be subject to shipping fees. The Junior League offers ground shipping via USPS within the 48 contiguous states. To avoid incurring shipping fees, you may purchase your books in person from The Pantry at the League building, which is open Tuesday through Saturday between 10 a.m. and 2 p.m. Thank you for your support of the Junior League of Houston and its mission.